I remember the first time I went to London in a series of disconnected snapshots. There was a train, with golden yellow doors, the taxi, with the flip down seats, stairs everywhere, up and down which I coughed, down to the underground and up to the top of St Paul’s Cathedral, right into the crowded little ball. What we ate, and where we went, beyond the whispering gallery and the traitor’s gate (intoned in sepulchral tones and viewed from a river boat) is long gone. What I know about that day (the coughing) comes from the memory of my parents. We spent the day shuttling around on all the different forms of transport there were to be found. These days, my visits to our capital city are dominated by trains. The thing that always amazes me about train travel is the encapsulating nature of it. You start off, sleepy station in a country town, yawning commuters and excited day-trippers, you chat to the interesting man who tells you he used to teach in a school for the blind and that you have brought it all back to him, to the not-so-interesting man who tells you (with accompanying bitterness) about his divorce as the countryside whips past, and before you know where you are, BOOM. Sleepy becomes rush, and you are tumbled out into the whirling vortex that is London. London is different to anywhere else I know. Everything moves faster, is bigger, more fashionable, shinier and harder edged. I sometimes wonder, as I dawdle my way, resistant to being swept along and thus finding myself accidentally hurtling along in the wrong direction, if it isn’t a bit puffed up. In love with the idea of its own importance. There are things in London that you can’t find anywhere else, you see. Things I saw through the window as I emerged from the smoke-blackened tunnels of the past and onto the gleaming, glasswalled, roller-coastered railway of the future. The Thames. The O2. A cable car ride across the river. Exhibition spaces of such monstrous size it takes you an age to traverse, sponsored by glamourous oil barons from far away. It’s a far cry from my little primary school dominated world, out here in the sticks. There is nothing glossy about the world of the primary classroom. Everything is covered in a faint layer of pencil shavings and bits of rubber. The children, the tables, the chairs, the books, everything is slightly smudged, seen through a layer of carbon. Even the new things don’t remain new for long. There is something on the hands of small children that means that everything they touch is indelibly stained at the first instant. A new book goes home, and comes back covered in the remains of breakfast, or tears. It takes longer to do anything in a school, too. There is no striding along, forging an individual path. We go at the speed of the slowest to get changed. It’s the same wherever there are children, it has to be said. Once you become a parent, you either accept that you are going to be late to everything from now on, or you plan backwards, meticulously working out the latest possible moment you need to start getting ready. Nothing about working in a school, nothing about working with children, I reckon, is glamorous. The contrast between something like the Academies Show and the classroom is stark, and disorienting. You could tell the teachers, weighed down with freebies; I chatted to a group of them on the train home (they’d collected enough mugs to kit out the staffroom), to a nice lady over lunch. We chewed our fingernails together and bewailed the fact that we had forgotten everything we were going to say. It’s easy to forget, in those circumstances, where everything is shiny and impressive and important, who you are and where you come from. The smell of pencil sharpenings and washing powder, the littleness of children is a long way away. It’s a good thing I took some family photos to remind everyone what we do, isn’t it? Taking part in the Duke of Edinburgh’s award scheme is not something that I ever did when I was at school. I must have missed the meeting or something; either that, or I took no notice of it, after an unhappy week spent at the Dartmoor Adventure Centre when I was twelve, and I was the only one who turned up without a sleeping bag. Sleeping bag inners were provided, the letter said, so my mum took it at its word and, while other girls unpacked their own pillows and pillow cases, I was left to make do with a sleeping bag inner and a ripped and dirty sleeping bag with half the stuffing falling out. Needless to say, I didn’t get much sleep that week, and my enthusiasm for the outdoors and adventures was dimmed. I didn’t really enjoy the activities either, it must be said. My group got lost when we ‘orienteered’ around a short course. I fell in the water, after going round and round in circles for a while, when it was me at the end of the canoe raft and I had to swap places with the one at the other end. I was too thin for the climbing harness and had to have a rope tied around my waist (I chickened out of the abseiling, which was probably a good thing). It wasn’t long before I was longing to go home. The husband, on the other hand, loved it. He went and achieved his gold award, and, after we married, introduce me to the delights of hiking with bikes, and walking up mountains. Up until our Scottish Holiday, my only experience in tents had been in my parents’ garden and was Not Good. I still get a bit funny about sleeping bags. Sam, with the support of his dad, has decided to give the Bronze award a go. Volunteering at a charity café, check. Sport (football), check. Skill (guitar), check. All we have left to do is the adventurous activity. He’ll go camping at forest school and we’re off up Pen Y Fan in a couple of weeks. Sam though, bless him, is not the happiest of campers. It always seems like so much fun until you actually have to go to bed, and then it all becomes a bit of a trial. He can’t get comfy in the sleeping bag. The ground is all slopy. There are funny noises. There’s weather. Last year, in the middle of a week away, he disappeared in the dark, only to be found, arms crossed and a most pugnacious of expressions applied, sitting in the car, determined to be taken to Grandma’s. Despite my early antipathy to life under canvas, tenting has become part of what we do, and so we persevere. For some people, though, it’s an amazing thought that someone with special needs should have been camping with his family. Only the other week, I was given a leaflet about it by someone who was surprised when I handed it back and suggested that they gave it to someone for whom it would be a new and exciting experience. It felt weird, and terribly middle class to tell her the tale of the camping trip to the sailing club, and the fact that Sam has his own boat (a kayak). It was a shock, because, once we moved away from the mainstream, and we grew away from the nursery years and we chased off the home visits from the social worker and all of those other things that happen when there is special needs in the family, I got used to not being patronised. You see, some people, and I include members of my own profession in this, forget that learning disability, or special educational needs, or whatever you want to call it, is no respecter of class or income. It’s as if special educational needs only happen to the disadvantaged, the poor or the working class. You know, the people you can blame for the whole Bad Parenting thing. That the answer to special needs is somehow to educate parents (send them on a parenting course, especially the mother), or get the children away from the parents (like the school for two-year-olds thing), to get the parents, those ignorant mistake makers to do as they are told because we, the professionals, are the ones who know what we are doing. It used to be said that illness and disability, or the Bad Things That Happen were the wages of sin. You did Bad Things, and you got what you deserved. The way of thinking that thought that Bad Things didn’t happen to Good People. Sad to say, when you get thinking about it, when you get to mulling over attitudes to special educational needs, how they must be the fault of the parents, for not doing as they are told, it doesn’t feel like we have moved on very far. I don’t suppose I am alone in that I am nervous of going to the dentist. When I was a very little girl it didn’t bother me at all. I would skip into the examination room and open my mouth wide, while the kindly looking old man would look inside with his funny little mirror and pat me on the head and send me on my merry way. It was as I grew up, and first the fillings and then the extractions came along that I changed my mind upon the nature of dentists. These days, I am careful to conceal my real feelings about taking my place upon the dentists’ chair, as I have usually got an audience. Three small people watch my every flinch, the involuntary toe tap as I attempt not to grit my teeth during a scale and polish; three small people take their cues from my reactions, rather in the same way they do around spiders. Out of respect for them, and an unwillingness to pass on my distaste (I mean, those gloves – yuck) in order that they grow into the habit of regular visits and good dental health, I hide my fear. Of course, where Sam is concerned, I have the added concern that his teeth, as crooked as mine were when I was his age, may not be as well formed as those of his typical siblings. During gestation, there is an arrested period of development in the formation of the skull of individuals with Trisomy 21 – which is expressed in a collection of facial feature and skull shaped possibilities and teeth that might come out a funny shape, or not have a proper root, or not have an adult tooth behind it at all. I know it’s shallow, but I am rather fond of Sam’s smile. In fact, I think I would go so far as to say that his smile, accompanied as it is by lovely white teeth (even if they are at the winky-wonky stage) is important to me. When he smiles, it catches in his eyes. Hearts lift. If something happened to damage it, I’d be bereft. So it was with trepidation that we went off to the hospital to find out exactly how many teeth he would have to have out in order to reduce the crowding and increase the chances of keeping them in good condition. 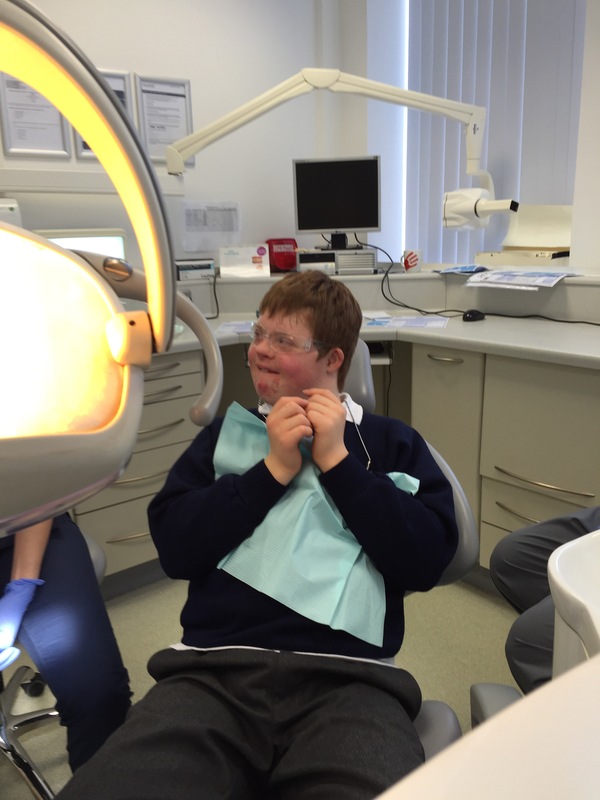 One x-ray later and a good telling off about oral hygiene (it seems that I must continue to supervise, even though he is in his mid-teens), it was with equal trepidation that we came home again – with an appointment for three extractions and a scale and polish. You see, unlike me, Sam has reached the fine old age of fifteen years without anyone ever doing anything to his teeth. Nothing more than a mirror and a poky thing has ever been in there – and when they look at him, I’m not entirely sure who they see. Do they see a young man who, if people take the time to explain what will happen and who they will reassure that nothing will hurt him? Or do they see an overgrown, unpredictable child? Do they see Sam, or do they see Down’s syndrome? Well, yesterday, Sam made sure that everyone in his local dentists’ saw him and not his condition. Yesterday, I think I was prouder than I have ever been of my boy. Yesterday, not only did he lie stiller than his mother can ever hope to do as his teeth were primped and polished, but he allowed two teeth to be extracted without even a sound, except for a self-deprecating ‘silly me’ when he realised that injection over, it wasn’t finished at it wasn’t time to go home. Yesterday, Sam was a bigger advocate for Down’s syndrome than I’ll ever be. And, as we walked away (with me reminding him not to pull at his lip, to wait until it had woken back up), I recognised that part of my anxiety was not just that someone might hurt or frighten my child, but that I was worried too. I was worried about his teeth (which are a bit funny, but look like they will be OK), I was worried about the dentist – was she afraid of treating him? I was worried, above all, about him, how he would react, how he would behave. I don’t know. Sometimes, without you noticing, your child does something amazing like doing a bit of growing up. Next time, I think I’ll have a little more confidence. I watched a short film the other day, while I was cooking the tea. (Actually, I watched it in two parts, because if I hadn’t I would have burnt said tea.) It made me cry, just a little bit. It touched me, partly because in it I recognised the heartache of a young mother and father when they received a diagnosis of Down’s syndrome in their baby, as yet unborn, and partly because I recognised something else. A tone of voice, a way of being, in another mother on the screen. The other mother, the one whose daughter was about the same age as my son, and who also had Down’s syndrome, like Sam. Sometimes I think people must think I am the most hard-hearted person imaginable. I can feel their frowning glances, the pity they direct at my son, every time we go to the supermarket, every time we shop for shoes, or clothes; every time we are anywhere where there might be the temptation to pick up, to try on, to slip something random and unnecessary into the shopping basket. I feel their gazes as we go about our business, pitying and yet accusatory. How can she speak to that poor little disabled boy that way? Can’t she see he’s only having a bit of fun, poor thing? It is wearing, I admit. Most times we go to the shops we make the same performance, and every time my voice, which started out so kind, so gentle, takes on the note I recognised in the woman in the film. Hard. Clipped. Tired. Lacking in patience. And Sam, he becomes an object of pity. The poor disabled boy with the horrible, cross mother. In a way, I can relate to how they feel. Years ago I felt the same, the day I sat in a review meeting and we talked about cuddles. As he draped his small body around mine and my arm snaked around his tiny waist, I wondered why a ban was so important. Why shouldn’t he have a cuddle if he needed one? He was only little after all. What I sense, though, is not the pity extended to all children of harsh, cross parents. You know, those kids we see, out and about at the shops and the park, on the receiving end of shouts and shoves, the hisses of barely contained rage and frustration, or the casual disregard for health or safety. That pity is easy to understand. I feel it myself (and sometimes towards the parents, the ones tiredly traipsing around the supermarket while their tired toddlers throw themselves to the floor over the chocolate biscuit or some other forbidden item). As teachers we’ve all met those kids we feel sorry for. I remember one young lady, let’s call her Katy. While she was in my class her mummy died. A nice woman, she was diagnosed with breast cancer and died in the holidays. Everyone knew about it. One day, at the beginning of term, most of the parents of the children in my class went to the funeral. For a while there was quiet. A sense of awe at the enormity of what had happened to Katy and her little sister. Or ‘Luisa’. One day, after school, I found her sitting in my classroom. She hadn’t gone home. Her mum was an alcoholic and, that day, Luisa had flatly refused to go home. She sat there, in her place, reading quietly, while she waited for her gran to pick her up. I could tell you about any number of kids I feel sorry for, whose wounds I would make better of only I could, just as I cure my own babies’ hurts with a kiss. But you see, those people who pity Sam, they don’t just do it because they see someone being bossed about; they pity him because they fail to take into account the fact that he will not always be young. They have forgotten that learning disabled people, or any kind of person come to that, will eventually grow up. It’s as if they see him in a perpetual state of childhood, a life stuck, like the needle in a scratched record. They, like the me of years ago, do not see the consequences of actions left unchecked. But I know that, unlike the children in my memory, unlike the illusion of constant childhood that teachers live with, making it difficult to imagine any of them any different than the day they were in our class, one day he will be grown up. And I don’t like to think of Sam, as a fully grown man, cuddling anyone he takes a fancy to, invading their space; acting inappropriately. I don’t like to think of grown up Sam, returning home with a bag of shopping, emptying out baseball hats and bananas, and wondering why he hasn’t enough food for the week, because no one ever told him ‘no’ and used that sharp, tired voice. Experience has taught me that it takes Sam a while to learn. And learn all sorts of kinds of self-control he has – and will. He may as well start now. There is a difference between sympathy and empathy.